The Documents page gives an employee access to their payslips and other PAYE documents relating to their employment. Any HR documents and resources uploaded by their employer can also be accessed here. Click 'Browse All Documents' to access all documents that have been uploaded to BrightPay Connect for you. Alternatively, click 'Documents' on the top menu bar. You will be provided with a payslip for each pay period on or before pay day. At minimum, your payslip will show your employer's details, information about you and your employment, your earnings before any deductions, the amounts of any deductions (e.g. tax and National Insurance), 'year to date' totals for the tax year, and your net 'take home' payment amount. Your payslips can be used as proof of your earnings, tax paid and any pension contributions. Your P60 shows a summary of your earnings and tax paid in the tax year (6 April to 5 April). You'll need your P60 to claim back overpaid tax, to apply for tax credits, or as proof of income if you apply for a loan or a mortgage. You'll get a P45 from your employer if and when you stop working for them. Your P45 shows how much tax you've paid on your salary so far in the tax year (6 April to 5 April). A P45 has several parts – you must give parts 2 and 3 to your new employer (or to Jobcentre Plus if you're not working). You may get a P11D from your employer if they have used it to tell HMRC about your 'benefits in kind' (e.g. company cars or interest-free loans). You may not get a P11D if your employer has taken the tax you owe on your benefits out of your pay. 2) If data from a previous tax year has been uploaded to BrightPay Connect by your employer, simply choose whether you wish to view 'Most Recent' or documents from a previous tax year at the top right of the screen. 3) Select the document you wish to view. This will now be previewed on screen. 4) Click the 'download' button at the top right to save the document to PDF. 1) Any HR documents or resources that your employer has uploaded for you e.g. your contract of employment, company handbook etc. 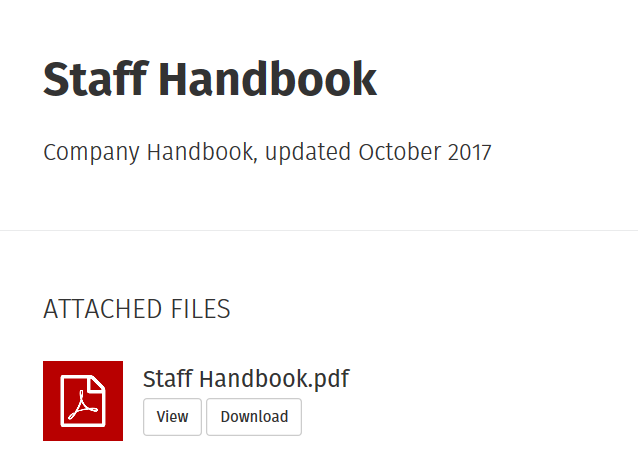 can be accessed within the HR Documents & Resources section.